The DNT is a non-profit making organisation which is a registered charity (charity number 503430). Chairman Mr John Scholey, Vice-Chairman Mr Michael Artley, Secretary Ms Gina Simpson, Press Officer Mr David Taylor and Treasurer Mr Peter Markham. Registered Office: 10 Macintosh Drive, Ashwood Gardens, Driffield YO25 5PH. It is responsible for the Driffield Navigation which is the waterway extending from the market town of Driffield along the Driffield Canal and then the River Hull southwards as far as Aike. The total length of the waterway classed as the Driffield Navigation is 11 miles (18 km). West Beck and Frodingham Beck are associated with this system. The DNT welcomes donations and legacies. Assisted by the Driffield Navigation Amenities Association (DNAA) it looks after the maintenance and administration of the Driffield Navigation for commercial, leisure,and recreational purposes. In addition to this environmental, conservation and heritage matters receive attention. Such work benefits children, young people and the public in general. It is important that this work is properly funded. Boat owners are asked to ensure that they pay their annual boat fee of £50.00P (all except small craft such as canoes and kayaks). Boat clubs are asked to pay a reasonable donation in lieu of individual annual fees on behalf of their members. Small boat users are asked to note that there is a fee of £5 per day for the launching of dinghies, canoes or other craft at Frodingham Landing. Under 17's no charge. All payments should be sent to the DNT Treasurer, Mr Peter Markham at the DNT registered office (address above). Boat trips are being run on Driffield Navigation. Every effort will be made to accommodate anyone wanting to take part in the trips. The cruises are ideal for viewing beautiful countryside, not normally seen from public roads, and observing birds and other wildlife. People can learn more about the historic waterway, or simply relax. This can be the ideal way for a group or family to have a celebration with a picnic and a bottle of champagne. A finger buffet can be arranged, but bring your own drinks. The trip boats, Lady Jayne and Driffield Navigator, have protection for passengers and crew against inclement weather. 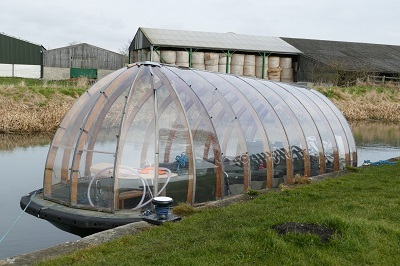 They are based at and operate from Frodingham Landing close to the B1249 Frodingham Bridge. 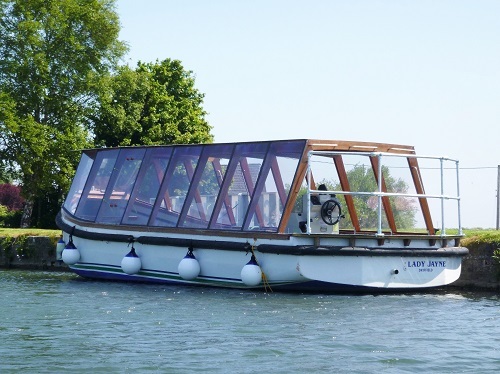 Lady Jayne can take up to 12 passengers, and Navigator a maximum of 10 passengers. The cost per boat is £60 per hour. Prices per passenger obviously vary according to numbers. Contact 01262 488599/07770937772 or 01377 270508. At present the use of the Navigation for its full length by boat traffic other than canoes and kayaks is impeded by a low fixed bridge across the canal at Wansford. 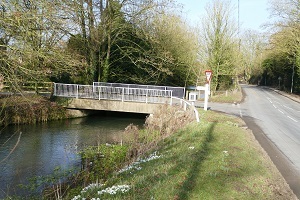 This bridge carries the road that connects Wansford and Skerne. The original bridge had been a swing bridge. This was replaced in 1967 with the present bridge by the then East Riding County Council, when the original bridge had fallen into disrepair. At the time the commercial traffic had ceased using the canal and the idea of the Navigation being used by recreational boat traffic had not taken root. It is most important that the fixed bridge at Wansford be replaced with a swing bridge so as to allow the movement of boats for the full length of the Navigation all the way to the market town of Driffield. The potential economic benefits to Driffield and the surrounding area could be substantial. Driffield has the potential to become an inland tourist destination with the development of Riverhead. Ambitious plans to turn an old grain warehouse into a heritage visitor centre for Driffield will be a major boost for the 250-year-old navigation. Driffield Navigation Trust, which manages the historic canal, hopes the dream for Mortimer's Warehouse, Riverhead, will become a reality. The canal trustees were delighted when Driffield Town Council won a £9,900 Heritage Lottery Fund grant to move the project forward. Now part of the grant has been used to employ heritage project specialist Sarah Oswald of The Authentic Spark to help drive the scheme ahead. The grant is enabling the council to put in place a management board that will take the lead in breathing new life into the landmark building. "The trust wants to see it become a heritage centre where the story of the canal and it's relevance to the growth of the town can be told. If the project gets off the ground and becomes a reality, it will certainly help the trust in its aims to make the canal fully navigable again. 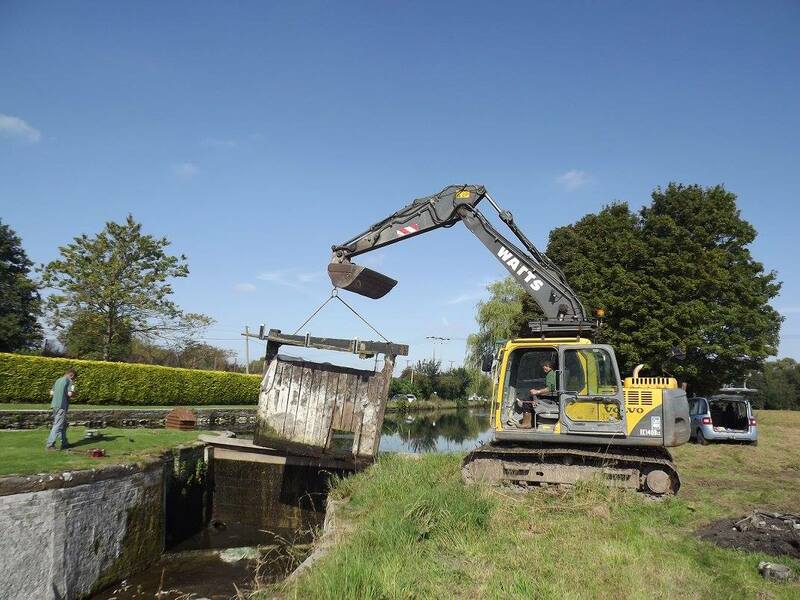 "Over the past 15 years, around £650,000 has been spent on renewing locks and bridges along the waterway, and we are keen to complete the job. If Mortimer's becomes a heritage centre, boating enthusiast will be keen to sail to Driffield to visit the facility, and that means having a fully working navigation. "We hope the project will lead to other funders and benefactors coming onboard to make the canal and showcase Riverhead area something really great for Driffield," he added. There are a number of heritage features at Riverhead, including warehouses, wharves and cranes, all of which reflect the canal's past as a working freight waterway. 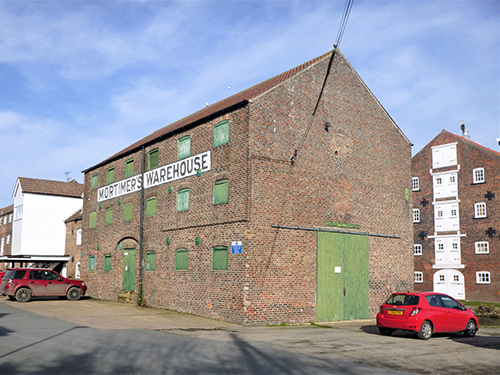 The town council is commited to working with the owners of Mortimer's Warehouse and other local partners, including the DNT and Driffield Navigation Amenities Association, to make the vision of creating a heritage visitor centre for Driffield, a reality. From all walks of life, hardworking and clever. Let its example all inspire. This link with the past may we never sever. To the embodiment of a dream and the epitome of zeal. A combination of imagination, enterprise, skill, sweat and toil. And those who dug the soil. What they achievedmay all respect and no one spoil! Have you any material about the driffield Navigation? Copyright © Driffield Navigation Trust 2018-2019, all rights reserved.